This article is written by Elinext’s software developer Ivan Polyakov. 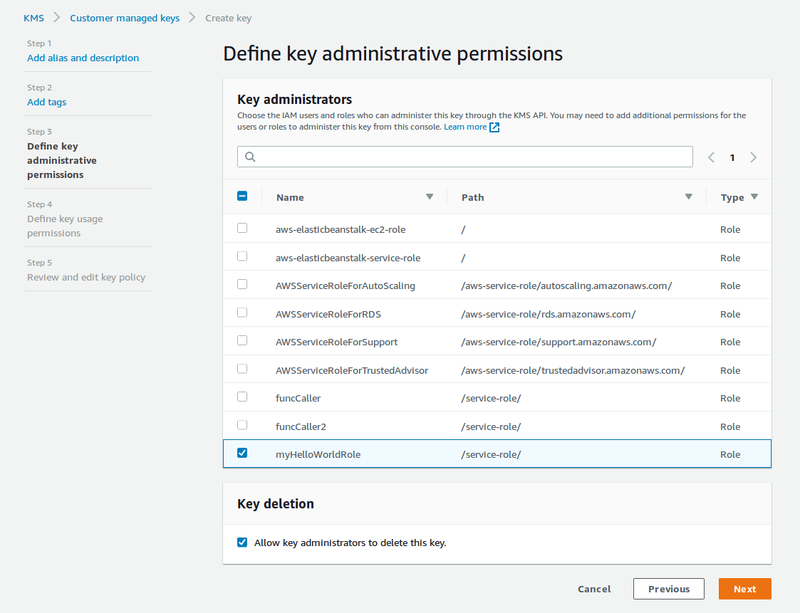 In this article, we will take a look at AWS Key Management Service. We will not go too deep into technical details, but some code examples will be considered to demonstrate the concept of the service. The article will provide you with proper vision of what it is, what lies behind the scenes and how can it be used in a project. Let’s begin. Everything related to the service is about data encryption. In view of the service name, you may think that it stores keys or passwords in a secure way. But actually, it does not store anything. It only gives you powerful tools to control your data encryption/decryption processes, according to the main concept of the service. If you need to dive more deeply into the details, please read official documentation. So, what is the main concept of the AWS KMS service? In a nutshell, it’s all about reliable tools to organize your encryption processes in a more secure way. All the processes can be separated into 2 levels of encryption using different types of keys. First encryption level is aimed at granting you with master keys, which are typically used to generate, encrypt, and decrypt the data keys. The important point of master keys is that such keys are created in AWS KMS and never leave it unencrypted. To use or manage your master keys, you access them through AWS KMS. Inside your application, you will work only with data keys. Second encryption level is aimed to encrypt and decrypt your data using data keys. These keys are used outside of AWS KMS and never stored, managed, or tracked by the service. It is your responsibility to decide where and how you will keep data keys. An important point of data keys is that such keys are generated using master keys in 2 forms: encrypted and unencrypted. The first form is only used to be stored somewhere. You should not store unencrypted data key anywhere. To do encryption or decryption, you need to use the second form, which can also be restored from the encrypted form using the master key. This strategy is known as envelope encryption. You can read more about this concept and envelope encryption strategy. First, you should proceed to master key creation. To do this, open AWS KMS console, go to “Customer managed keys” section and click on the “create key” button. The key creation form will open. This form is split into several steps. During the first step, you can specify an alias for the key. Later, alias can be used instead of key ID. If you need more details about aliases, that form has a link to the documentation. Let’s use myMasterKey alias and click on the “next” button. In the second step you can specify a tag to categorize the key. If you need more details about tags, that form has a link to the documentation. But, we will leave it empty in this example and click on the “next” button. On the third step you can select the roles to define who can manage your key using AWS KMS API. If you need more details about roles usage, that form has a link to the documentation. In the fourth step you can select the roles to define key usage permissions. It affects data encryption and decryption with the AWS KMS API. This step looks similar to the previous one, so there’s no need to post a screenshot. Just select the roles and click on the “next” button. After that, you will see the final step with the key details, where you can review and edit the key policy. But, as we are satisfied with the current result, we will do click on the “finish” button. In the opened list of keys, we can see a new key. Its ID is highlighted on the screen below, and later will be used to call API methods. Now, we have the master key and we can generate data key to start the data encryption process. It can be achieved in 2 ways. 1) Using KMS API in the application. 2) Using KMS command line tool. Inside the application, to start data encryption/decryption, we will first need to get the master key. As you already know, this key is stored in the AWS account only, and the application keeps solely data keys. It is assumed, that AWS API itself is already configured with correct credentials. So we will focus on interesting API methods for our case only. If you’re interested to know how to install AWS API you can read the description there. All the code snippets will be provided using PHP language. ‘credentials’ => $credentials // <— for your account. As you can see, to generate a data key, we need to know only the master key’s ID and the algorithm to crypt. As a result, this method returns an object which holds 2 representation of a data key. The first one is encrypted, the second one is in the plaintext format. Why so? Because inside an application, we should store only encrypted key. But all the operation with data will be performed using a plaintext key. After all the operations are done, the plaintext key should be removed. So, now we have generated the data key, and can start the data encryption process. For this part, AWS API is no longer needed. We can use native PHP means. $key = base64_encode($dataKey[‘Plaintext’]); // <— Plaintext data key. In the sample above, both encryption and decryption processes go together. But in reality, the flow will be different. Following the encryption, the plaintext data key will be deleted, and the encrypted data key will most likely be stored in the database. Then, when data will be decrypted back, and the encrypted data key will be extracted from database end decrypted to plaintext format. $ciphertextBlobDataKey; // <— get encrypted value from database. That is all you need to do basic data encoding / decoding. Of course, KMS API provides much more actions to manipulate the data. You can find all of it there. Another way of using AWS KMS service is executing console commands either manually or by application. To do so, you need to install AWS Encryption CLI SDK first, and you can find how to do it there. To understand the basics with more examples, please see this documentation page. AWS KMS service allows you to bring data protection topic for your application on the next level. If an application keeps some sensitive information in the database or any other storages, potentially it can be stolen. Thus, keeping the data in a plain format or an insufficient level of encryption, potentially provides a way to still it and decrypt. Especially, if encryption keys are stored along with the data. With AWS KMS service you can encrypt everything including encryption keys itself. And keep your master key out of an application. An additional level of protection can be achieved by using AWS KMS service with conjunction with AWS SecretManager service which can keep all the credentials you have in secured place and in secured form. For example, you can move all the passwords from configuration files to AWS SM service and load it in an application at runtime. Such a conjunction allows to achieve proper security and data protection. No sensitive information like passwords is present neither in files nor database. All the sensitive data is encrypted including encryption key. Only you need is to properly protect AWS API credentials on the server. Regarding pricing, AWS KMS includes 20 000 free requests per month and 1 USD for each master key. AWS SM is free during the first month of use. Then, it costs 0,05 USD for 10 000 API calls and 0,40 USD for a single confidential point of information.